A lot of (nerd) humour in this title 🙂 It can be read in two ways. The first is: “Am I a smart music composer ?” (the answer is: no) and the second is: “Artificial musical Intelligence – a smart music composer”. In practice, the purpose of this small project is to test an algorithm able to randomly generate a “decent” music. It could be easily done with a PC, using its huge HW / SW resources, but I want to do it with a very small microcontroller circuit based on STM8S001J micro, using my own firmware written in C language. The software project is splitted in two parts: the first is “the player”, the part that just plays a melody stored in the microcontroller’s memory; the second is the algorithm that generates such melody in a random way. Let’s start from the first part, the “music player”. Differences from the prototype picture: R6 is 330R on the prototype and R3 was added to reduce sound level while recording the song with PC audio software. You can download the schematic in PDF format from this link. The circuit is very simple and can be easily built on a prototype board. 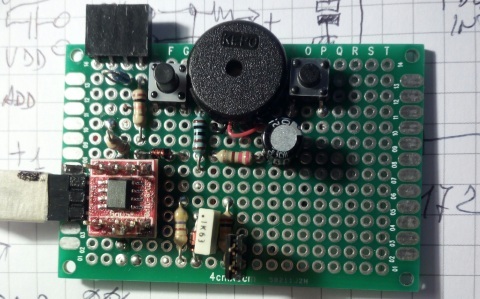 The piezo buzzer LS1 has low audio volume (it’s just a local “monitor”), but you can take the audio signal from J2 connector and send it to an amplifier. I decided to create a very small ADSR (Attack-Decay-Sustain-Release) in order to have a sound like a “ding” and not the usual “beep”. The I/Os PC5-PC4-PC3 (pin 7) are used all together to give the current necessary to charge the 100uF capacitor used in ADSR. The envelope of such ADSR circuit has the shape that you can see in the next image. There is a screenshot of the Audacity open-source software used to record the default song “Happy Birthday to you” produced by the test firmware. Here is how such “song” is stored in the microcontroller’s memory. In this first section, the notes and their durations are stored as a constants array (FLASH memory), but in the final version the random song will be generated in a RAM array. The player, however, will act in the same way. The duration of every note is expressed in 50mS steps. The note “0” is a pause. 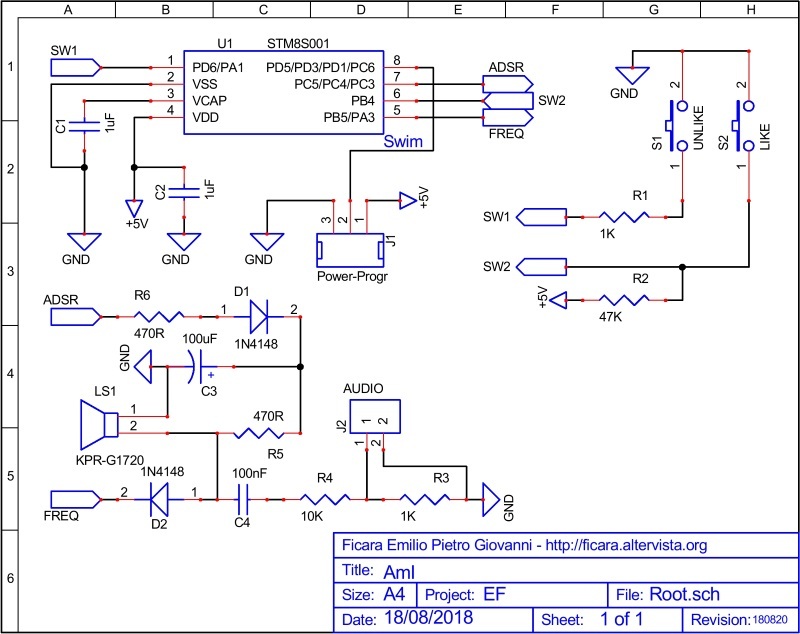 If you want to build this circuit, and improve or modify the first version of the firmware, click the link AmI for the full project folder, with C sources, ready to be edited, compiled and debugged using the free Cosmic-C and STM tools (read my previous articles on this subject). The working folder is zipped, so use the 7Z program with password eficara to extract it. The two buttons “like” and “unlike”, in this test firmware, are used just to start and stop the sequence. Note that the stop button is sampled only at the end of a note, so you must press and hold it down up to the end of a note to stop the song. 3 = 3     "      "     11 = 3     "       "
4 = 4     "      "     12 = 4     "       "
5 = 5     "      "     13 = 5     "       "
6 = 6     "      "     14 = 6     "       "
7 = 7     "      "     15 = 7     "       "
If you want to try with this small application, download the midimio.zip file from my website (look at the page PC Music). It’s a very small and simple program, but it is enough to write simple melodies. To compose a melody, use the checkboxes to select the note and the duration, then click the red button to save the event. The arrows at the sides of the red button move back and forward in the melody. When all the melody has been entered, you can play it with the buttons at the top right of the screen (play, stop, begin, end). 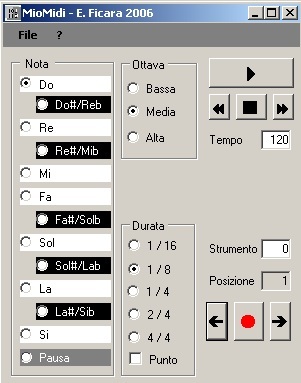 The musical instrument can be changed modifying the value in the box “Strumento“. Your PC must be able to play MIDI, to use this program. Note that there are no editing functions ! If you want to modify an event, just use the arrows to move to such event and replace it with a new one, selecting it with the checkboxes, then click the red button. To clear all, restart the program. You can save / reload melodies using the “File” menu tab. In this case, the rules 7,4 and 1 have more chances to be extracted. So, every “like” and “unlike” will change the probabilities of the rules of 1 of 4, so 25%. The initial values for the rules are set to 2 of 4, or 50%. When all the bits for a rule are filled (all at 1), no additional increment can be done, while if all bits for a rule are erased (all at 0), a new rule will be randomly generated, with 50% of probability (2 of 4 bits). The 4 bytes (32 bits) containing this table are stored, like the rules, in non-volatile memory (Eeprom). As you can see, I used two 16 bits shift registers slrand and slrand with two different feedbacks. The first uses bits 14 and 11 as shift input, while the second uses bits 15 and 10. As additional randomness, I used the last bit of previous generated random value to select which register must be used to update the output. The function doesn’t return a value, but just modifies the global variale rand that is used in various parts of the program. 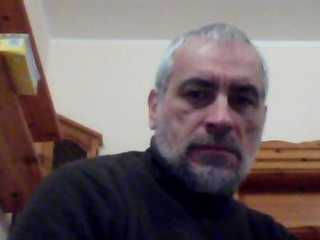 The function is continuously called in the main loop of the program to randomize the rumber more often. The output range of the byte rand is 0 to 255. The shift registers must be initialized with a non-zero value. I used this small function for the initialization. The function is called the first time one button is pressed to start the song generation and takes the seed from the timer TIM4, that is started immediatly after the reset. If you want to try by yourself, load the zipped file AmI_2.zip, decompress it using the 7Z program with password: eficara and then you will have the full project folder, with the C sources and the .S19 files. In the sub-folder named “release” there are the files: AmI.s19 to burn the program area of the microcontroller and the file rules.s19 to burn the eeprom area of the micro. If you want to start from more advanced rules and probabilities (based on my feedbacks), use the third file newrules.s19 to burn the eeprom area. The option bytes are untouched, leave them as they are in a new STM8S001J device. If you press PLUS1 (like), the program calls the routine that increments the probabilities for the used rules (UpgradeProbs). If you press MINUS1 (unlike) the called routine is the one that diminishes the probabilities of the rules used (DowngradeProbs) and eventually generates a new rule if the probabilities reached zero. Finally, if you don’t press any key in the 5 seconds time, the probabilities are not modified. Note that if you press both the keys, you will have first an increment, then a decrement… I did it just for testing purposes. You can use the swim interface to read the eeprom and observe the variations in the rules and in the probabilities after giving your feedback (the micro will be reset). Obviously, the melody will be different if you run your own device, ‘cause it’s a collection of random rules. Have fun experimenting ! Bye.